We know that he was an immigrant to the United States from Germany in the late 1800’s. We know he lived and traveled extensively though New England and the mid-west. We know that most of his bottles were not signed but when he did sign a bottle, he might spell his first name as: Carl, Karl, Chas, or simply K; and his last name as: Worner, W?rner, or Warner. And, we know that after 1919 no additional documentable information about the man has surfaced to this point. Carl Worner was a prolific builder with a very distinctive style. 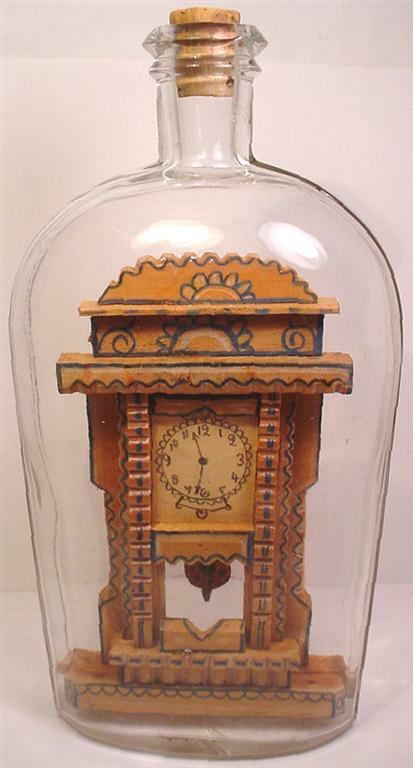 He built four main categories of bottles: crucifixion scenes, clocks, bar or saloon scenes, and non-saloon dioramas. Among Worner’s non-saloon dioramas were bottles of bakeries , meat markets, a cigar factory, shoe repair shops, a tailor shop, an office, a funeral home (complete with a body in the casket), a marine diorama (with a woman waving to man sailing away in a small boat), a Catholic church altar scene, private homes (including one with the man in lederhosen), and a very different outdoor woodsman scene. 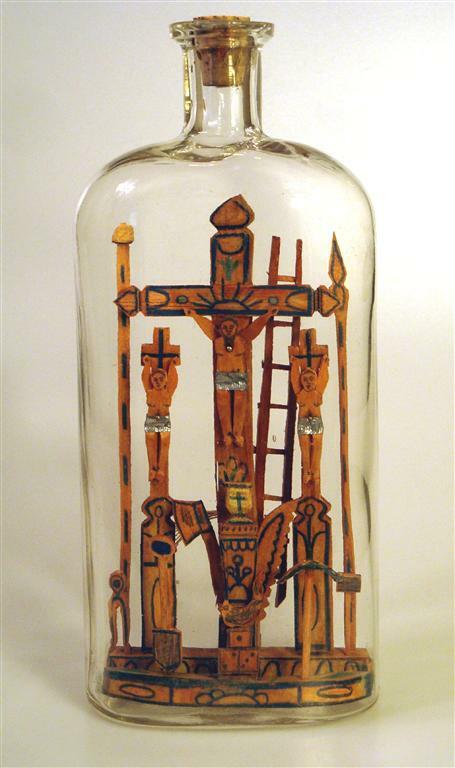 His known four religious bottles, believed to be his earliest bottles, were colorfully decorated scenes of Jesus and the two thieves hanging on crosses. He also built at least six clocks. It is interesting to note that of the six clock bottles known to exist at least three of them show the same time of 11:37 on the face of the clock. Did this time have some special meaning or significance to Worner? Or, did he perhaps prepare several clock faces at the same time and simply chose that as the time to use? 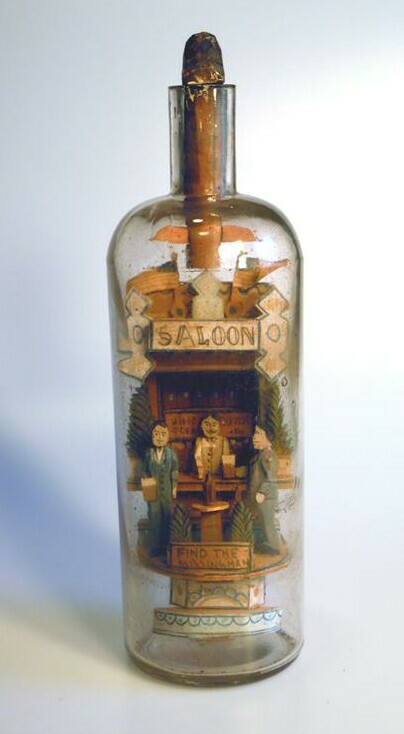 Of all of his bottles, Worner is best known for his Saloon Bottles with many of them containing a “Find the Missing Man” sign. These bottles have a hidden man, often under the floor toward the back of the bottle and located inside a privy. Many of these bottles had the name of the establishment and sometimes a date and through this information we have been able to track some of his travels. He identified himself as a “Sailor” in two of his bottles, one of which said “U.S. Sailor” and he likely worked on the Great Lakes and on many of the rivers and canals which accounted for much of his travels. It is also possible that he worked as a porter. It is hoped that we will learn about more about Carl Worner in the future through census records, newspaper or other printed materials from the period, or perhaps though additional bottles which will likely surface over time. It may be that you own or know someone who owns one of his bottles or has information about him. If so, please contact me using the “Contact” tab in the menu bar. A Carl Worner bottle was appraised on the Antiques RoadShow on August 21, 2010. It was appraised in Washington, District of Columbia bu Allan Katz in the price range of $3,000 - $4,000.It appears in Episode: Washington, Hour 2 (#1517) and was originally aired on May 30, 2011. Click on the following link to view that appraisal.